Animation can be a powerful tool in that it gives an artist the means to let himself go, without worrying about restrictions like a low budget, comprehensible logic or even elementary laws of physics. And yet, just about every animated film there is, simply tries to mimic everyday life: People look like people, animals like animals, and the whole world is still just good old planet earth. 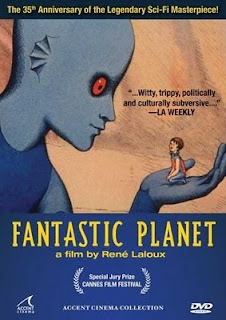 But then there is the Fantastic Planet, a psychedelic trip of a film that truly lives up to its title. It tells the story of a strange race of giants on a wonderfully weird world, who keep another strange race of miniature men as pets. Although both creeds have their own bizarre peculiarities, after a while you somehow get the idea that they might not be so different from humans after all. The film is a kind of social satire, where one of the races might be a parody of us. The only question is which one. Really great animated films for adults is a rare thing, so be sure to catch this gem and get ready for a totally different experience. Been wanting to see this forever!